Soft Skull Press, 9781593764418, 371pp. 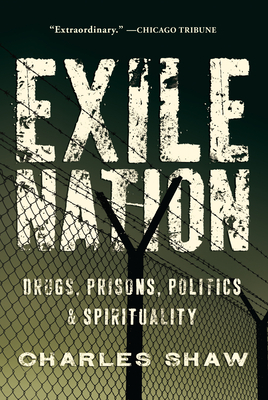 Originally published as a series on Reality Sandwich and The Huffington Post, Exile Nation is a work of "spiritual journalism" that grapples with the themes of drugs, prisons, politics, and spirituality through Shaw's personal story. In 2005, Shaw was arrested in Chicago for possession of MDMA and was sent to prison for one year. Shaw not only looks at the current prison system and its many destructive flaws, but also at how American culture regards criminals and those who live outside of society. He begins his story at Chicago's Cook County Jail, and uses its sprawling, highly corrupt infrastructure to build upon his overarching argument. This is an insider's look at the forgotten or excluded segments of our society, the disenfranchised lifestyles and subcultures existing in what Shaw calls the "exile nation." They are those who lost some or all of their ability to participate in the full opportunities of society because of an arrest or conviction for a non-violent, drug-related, or "moral" offense, those who cannot participate in the credit economy, and those with lifestyle choices that involve radical politics and sexuality, cognitive liberty, and unorthodox spiritual and healing practices. Together they make up the new "evolutionary counterculture" of the most significant epoch in human history.